Back in April, Jing Tian (景甜) attended the press conference of 'The Warring States (战国)' wearing Mary Katrantzou Spring/Summer 2011 dress. Christian Louboutin Super Dombasle 160 Patent Sandals to complete her look. Chinese actress, Tang Wei was in South Korea to attend Samsung Smart TV event held on May 25, 2011 at Lotte Cinema, Konkuk University. She was spotted in the same dress which Jing Tian (景甜) wore, without the shoulders guard as since on the runway. A simple silver bracelet with grey sandals to complete her look. 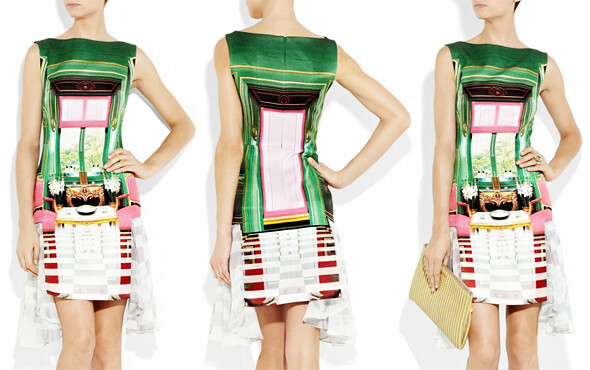 The Gateway Printed Silk and Cotton-Blend Dress retails on Net-A-Porter for USD$2020.00. 2NE1's Park Bom (박봄) was also seen in the same dress. Unfortunately, she is not included in the poll.